High-octane trombone soloist Bob Ferrel makes it clear that he means business on this dynamic album. Bob Ferrel's trombone is beautiful and impressive. One of my favorite cd from now on. All the songs are just great, definitely a cd that everybody should have! 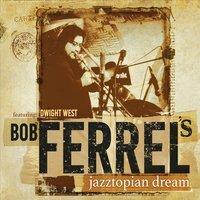 It's not hard to pick a track on trombonist's Bob Ferrel's new CD that matches your mood because there is so much jazz ground covered here. From virtuosic, acrobatic solos performed by Bob himself, through lush instrumental ensemble ballads, this CD has a lot to offer. You'll find many talented soloists featured throughout, a hard hitting yet sensitive rhythm section, and several vocal tracks featuring the wonderful Dwight West. It's a great listen the first time through; you'll want to go back for seconds and more. A CD worth owning! It is rare to find a CD without one filler song, this is one of those CDs. Bob Ferrel nailed it! Each song, each solo is better than the previous one. A CD well worth adding to your collection. Some of the best trombon-ing I've ever heard! Expressive, artistic and a beautiful tone to Mr. Ferrel's playing. If you're a fan of jazz or just want to hear some of amazing trombone playing, then you NEED this CD! Everyone is in great blowing form here, from top to bottom. I especially enjoy solos from Bob's long time friends and colleagues trumpeters Vinnie Cutro and Rob Henke. Charts are all great and flawlessly played, and such a wide variety of styles, it's all there! But Bob, with his virtuoso trombone playing is front and center, and man does he deliver. One can hear many influences in Bob's playing, from JJ, to Watrous, Manglesdorff and Roswell Rudd, and like a real artist, he synthesizes those influences into his own unique voice. Great for the trombone, and great for jazz. One senses this collection is a true career achievement, reflective of a lifetime of collaboration, artistic growth and alotta wood shedding! Congrats!! !